The Trans-Siberian Orchestra 2018 - West Coast Winter Tour Program. ONLY available signed by Greg Hildebrandt through Spiderweb Art Gallery! As our beloved fans well know, each year we work our hardest to bring you new content, ideas, and designs. Every year there is something new and exciting in our programs, because we know how incredibly special they are to you and to us! 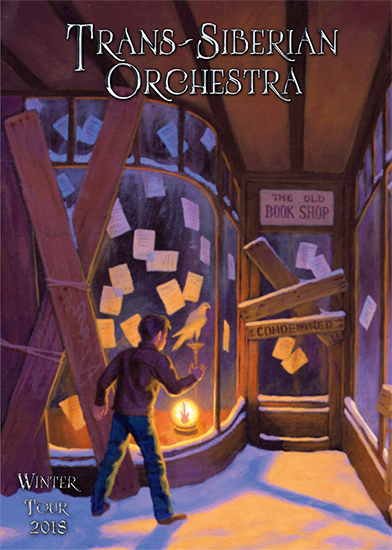 This beautiful program features a wrap around four panel outside cover with a new illustration by Greg Hildebrandt created exclusively for this Trans-Siberian Orchestra tour — plus, there there are 4 more illustrations on the inside cover! The 2018 program features 32 pages of exciting photography and breathtaking artwork from last year’s tour. The performers from both East and West coast are included in this program. This is the perfect collectible for all TSO fans!